Fossil finger bones of early human ancestors suggest that Neanderthals were more promiscuous than human populations today, a study using research compiled by the University of Southampton has found. Lisa Cashmore, a former Archaeology Phd student, provided data for researchers at the universities of Liverpool and Oxford, in collaboration with the University of Calgary, that used finger ratios from fossilised skeletal remains of early apes and extinct hominins, as indicators of the levels of exposure species had to prenatal androgens – a group of hormones that is important in the development of masculine characteristics such as aggression and promiscuity. It is thought that androgens, such as testosterone, affect finger length during development in the womb. High levels of the hormones increase the length of the fourth finger in comparison to the second finger, resulting in a low index to ring finger ratio. 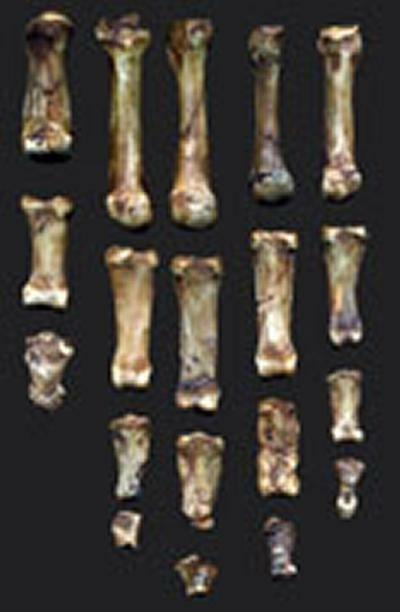 Researchers analysed the fossil finger bone ratios of Neanderthals and early apes, as well as hominins, Ardipithecus ramidus and Australopithecus afarensis, to further understanding of their social behaviour. The team found that the fossil finger ratios of Neanderthals, and early members of the human species, were lower than most living humans, which suggests that they had been exposed to high levels of prenatal androgens. This indicates that early humans were likely to be more competitive and promiscuous than people today. The results also suggest that early hominin, Australopithecus - dating from approximately three to four million years ago - was likely to be monogamous, whereas the earlier Ardipithecus appears to have been highly promiscuous and more similar to living great apes. The research suggests that more fossils are needed to fully understand the social behaviour of these two groups. The research is supported by the British Academy Centenary Research Project, ‘Lucy to Language’ and published in Proceedings of the Royal Society B.